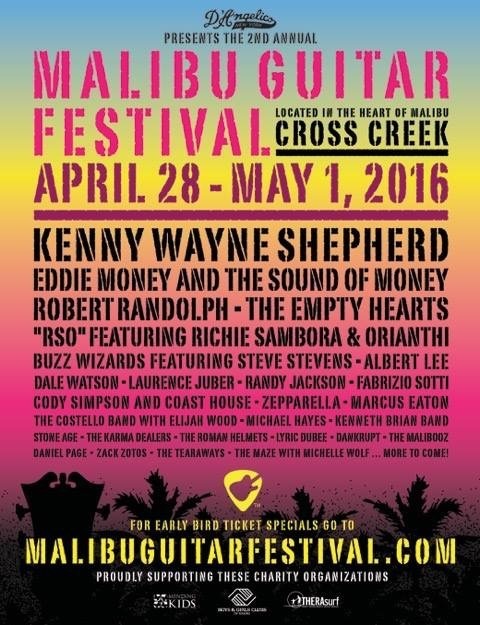 FROM APRIL 28- May 1, THE ANNUAL MALIBU GUITAR FESTIVAL PRESENTED BY D’ANGELICO GUITARS WILL TAKE PLACE IN MALIBU, CALIFORNIA. Early Bird ticket link for purchase here: https://www.ticketfly.com/org/6059. Malibu Guitar Festival co-founder Doug Deluca, a music and guitar lover who lives in Malibu, partnered with good friend John Watkin in an effort to bring a high level music and entertainment experience to the seaside town. The duo saw an opportunity to bring the community together, by securing globally renowned, award-winning musicians to perform, while also supporting local musicians and giving back to charity. Steve Ferrone, drummer for Tom Petty And The Heartbreakers, was tapped to become the festival’s Music Director. The community and outlying regions have fully embraced their concept, which was recently awarded with a Malibu Times’ “Dolphin Award” in recognition of their service, commitment and contribution to Malibu. The 2015 Malibu Guitar Festival raised more than $30,000 for Boys & Girls Club of Malibu, Little Kids Rock and the Malibu Special Education Foundation. Personally this year has been very creatively rewarding , besides our upcoming shows with The Empty Hearts, I’ve been enjoying my day job with Blondie. We’ve been working on a new album for the last few months & we’re all very excited about it. I think it’s the record our fans have been waiting for. We have a few special guests on the record as well. So far, Joan Jett & Laurie Anderson have been in the studio with us. The sound of the record really echoes our roots in the culture and New York City. Another part of this year has not been so good with the loss of many great artists. Sadly, we’ve lost David Bowie & Merle Haggard among many others. As far as some highlights of 2015, I’d have to say my trip to Sardinia would top my list. It’s such a beautiful place . How did Empty Hearts first form? You’ve had various experiences in several different groups. How does Empty Hearts compare to them all? The Empty Hearts is a labor of love when the 4 of us as friends came together to make music influenced by the great RocknRoll we all grew up with . Our sound is very much influenced by the roots of RocknRoll . Everyone from Little Richard and Chuck Berry to The Who, The Kinks and The Beatles. It all informs the sound of the empty hearts. Nothing beats the feeling of community you get from playing music with your friends. I think we’ve learned from our experience of working with many different musicians over the years & we bring that wealth of experience to the empty hearts. How do you think Empty Hearts music is showcasing each of the band member’s talents? We are all fans of each other’s work & musicianship. Everyone contributes to the sound of the band & allows for each of us to be featured in our own right. The music is very collaborative. I’m curious to know what’s it like when you are all working together in the studio. That’s a lot of experience and musical knowledge in one room! I think I may have just answered that . We all enjoy being around each other & take every opportunity to jam on one of our favorite songs also just playing together in the studio sometimes allows a song to appear out of thin air. I think we all respect each other’s opinions & abilities & thank comes into play in the studio. 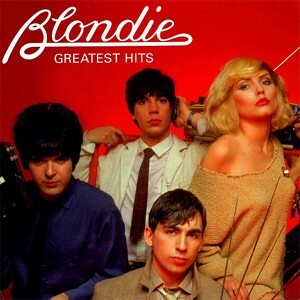 Looking back on your time on the drummer for Blondie, What do you consider a particularly proud moment from that phase of your life? I’d have to say being inducted into the RocknRoll Hall of Fame in 2007 was a highlight for me although it was bittersweet. Also our first USA national tour was supporting Iggy Pop and David Bowie when our first record was released. They were both musical heroes for me and and I could not believe we all got to hang out on tour for 6 weeks, let alone the fact that I got to see their show every night! Do you think that what drives and motivate you to make music changed over the years? What do you think has stayed the same? My muse has always been the music and honestly, that hasn’t changed. I’ve been very lucky and fortunate with my personal success where I’m not so much motivated by the economics of the music biz. I’m a big music fan and I really enjoy creating and listening to new music as well as all the greats. You are considered to be one of the 100 greatest drummers of all time so I’m curious to know when you first started playing the drums. Was it something that you took to naturally? Who first inspired you play? I was inspired by Ringo Starr and the Beatles. I began playing in my early teens and was always in a band from the beginning and that’s really how I developed as a musician. Making mistakes in public is a great way to learn about stagecraft. I’m left handed like Ringo and play a right handed kit which can make for a bit of a unique style of playing. I also play a bit of guitar although left handed. I also did a bit of piano on the Empty Hearts record but drumming does come very naturally to me. Who are your favorite drummers? What musicians consistently inspire you and your music? Is there anyone that you would love to work with in the future? I’d love to work with or at least meet Chuck Berry & Little Richard . I’d really like to jam on some roots RocknRoll tunes with Bruce Springsteen. Some of my favorite drummers are Earl Palmer, Hal Blaine, Ringo Starr, Keith Moon, Jerry Nolan and Tommy Ramone. I also really like Mo Tucker and Elvis Jones. Can you explain what the Clem Burke Drumming project is all about? How involved with it are you? Where did the idea for it come from? The Clem Burke drumming project studies the physical & mental attributes of drumming & creativity as it affects the brain & body in general. Dr. Marcus Smith at the University of Chichester came to me with the idea of the study about 15 years ago. Dr. Smith was a fan and consultant to the UK Olympic boxing team & wanted to make the analogy between sports & drumming. The study is still ongoing and yes, I’m still involved. There is some great news forthcoming about our studies! 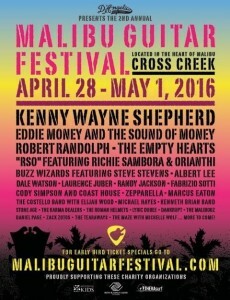 How did your group get involved with the Malibu Guitar Festival coming up soon? We met the promoter, Doug Deluca when we were doing a gig for D’Angelico guitars at these years NAMM show in LA . Doug saw the show and loved it and asked us if we were interested in performing at the festival. We’re excited to be on the bill with lots of other great artists. At the end of the day, what do you hope is the message of your music? What do you hope listeners take away from the songs of Empty Hearts today? 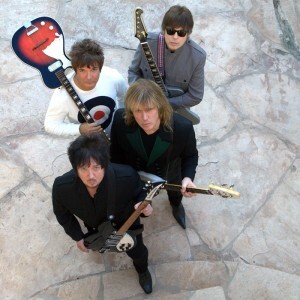 The empty hearts message is basically the love and enthusiasm we have for RocknRoll music! We want people to have fun when they see us play. We are lifetime devotees to the power of RocknRoll. We like to think we’re bringing the music forward and connecting the dots from the roots of the music in the 50’s & bringing it into the 21st century !